Tommy played for Hillwood Boys Club before starting his professional career at Clydebank, where he made his debut in the 1981-82 season. He quickly became a regular in the side, and over the next three seasons made a name for himself with an impressive scoring record at Kilbowie. 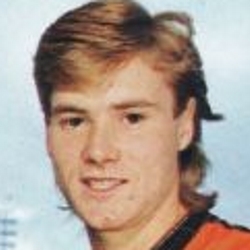 His form began to attract attention from other clubs, and Jim McLean, who tried to sign Coyne when he was a schoolboy, brought the striker to Tannadice in October 1983 for a reported £65,000. Making his debut against Motherwell at Fir Park the next day, he went on to appear in over 20 matches that season, including a substitute appearance against Roma in the European Cup semi-final at Tannadice. His career at United never really took off and he was constantly battling for a first team place against established players Paul Sturrock and Davie Dodds. When Dodds departed in July 1986, it looked like Coyne would finally get a run in the team. However, with the arrival of Iain Ferguson from Rangers and the emergence of Kevin Gallacher from the youth system, Coyne remained down the pecking order. With Ferguson having not been registered in time for the early rounds of the UEFA Cup, Tommy was given a starting place against RC Lens at Tannadice, scoring the crucial winning goal to start United off on their run to the final that season. 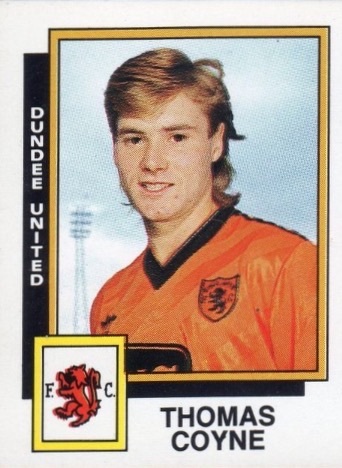 In November 1986 he asked for a transfer request and within weeks he left to join neighbours Dundee for £75,000. He rediscovered his scoring touch at Dens Park, forming a prolific partnership with Keith Wright, before leaving to join Celtic for £500,000 in March 1989. During his four years at Parkhead, he collected a Scottish Cup runners-up medal in 1990, and was capped at international level for the Republic of Ireland. He moved on to Tranmere Rovers in 1993, but his time in England was cut short after the tragic death of his wife. He returned to Scotland to sign for Motherwell in November 1993, scoring regularly as the Fir Park side competed at the top end of the Premier table, and made three appearances in the 1994 World Cup finals in America. He returned to Dundee for a second spell in 1998 and then a short stay on loan at Falkirk before returning to Clydebank as player/manager in 2000. The striker finished his career Albion Rovers, and went into management at Junior level. Tommy was born on this date in Govan, Glasgow. United dropped their first away point of the season after a fiercely contested battle. 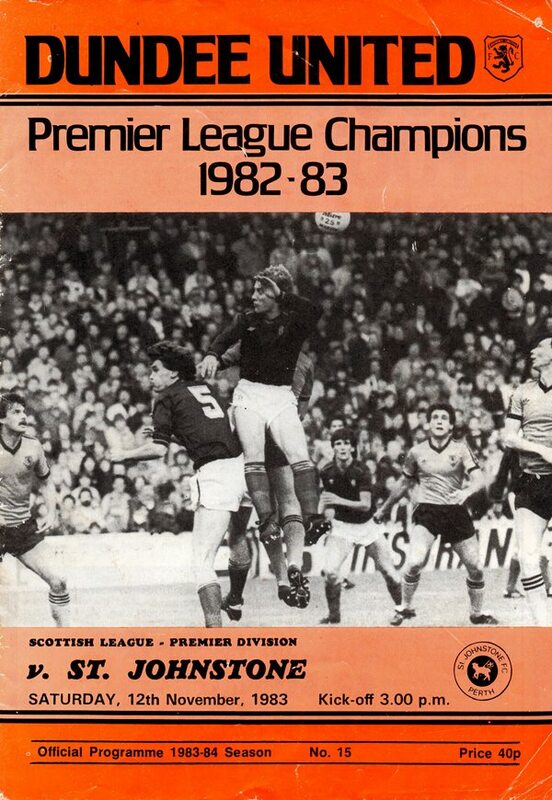 Yet in the opening stages/ despite the tricky wind the Tannadice men played fluently, and took an early lead when Derek Johnstone laid the ball in Davie Dodds path and the big striker beat Walker from just inside the box. Five minutes later John Gahagan's solo run ended with him prodding the ball past Hamish McAlpine. 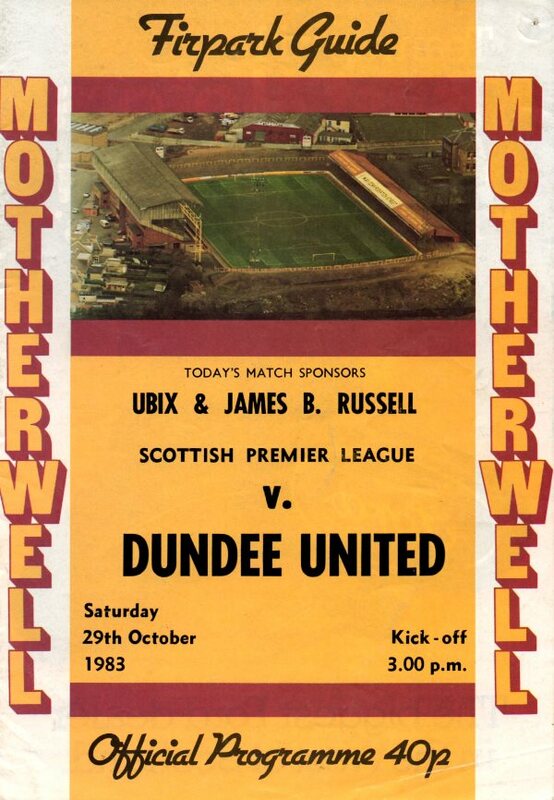 United's first home Premier match on a Sunday completed a hat-trick of successes over the Jam Tarts at Tannadice this season. The home side, however, had to come from behind. After only 8 minutes a flick from John Robertson was picked up by captain Walter Kidd who ran in to score. The equaliser came 13 minutes later when Paul Sturrock got in a shot after appeals for a penalty. His effort was going wide but Eamonn Bannon followed up to side-foot home from close range. Four minutes later United were ahead. Hamish McAlpine's throw found Eamonn Bannon, his run up the left was followed by a perfect cross which Tom Coyne headed in via the post. Two own goals helped United to their biggest home win of the season so far. In the first half Iain Ferguson opened the scoring in the 24th minute, closely followed by United’s second when the first of the Own Goal’s was converted by John Philliben. In normal circumstances, dropping a point at home would be regarded as a point lost. Circumstances however were far from normal. How could they be as we faced up to an Aberdeen side, almost back to full strength, without Maurice Malpas, Paul Hegarty, Eamonn Bannon and Paul Sturrock. The outcome of a goal-less draw belied what was an excellent match. Both sides had chances with Billy Thomson defying Bett's long range effort with a tremendous save, the post coming to Billy's rescue when a Davie Dodds flick beat him and earlier John Hewitt should have scored when he took advantage of John Clark's misplaced pass back.